Organize your kitchen and provide quick access to essential dry ingredients with this Baker's Mark 12.6 gallon shelf ingredient bin. Depending upon your kitchen layout, this bin can be stacked on your countertop, under a prep table, or positioned on shelving. A ribbed top and bottom ensure a secure fit for other stacked Baker's Mark12.6 gallon bins. Additionally, a front and back handle are available to easily move or reposition bins. This bin is big!! Hold 75# of flour easy, and the included scoop is really great! The cover locks with two pieces, so you can safety store dry goods. Having a startup cafe, we needed all equipment for our cafe and this one is just right. This worked as expected and it's just the perfect size to store our 50# dry ingredients in. I purchase several of these last year to tidy up and unclutter my bakery. These 12.6 gallon bins store an amazing amount of flour and sugar! Fast delivery. High quality and useful. Keep product safe and dry. My staffs are happy to keep organize in our kitchen. Deliver with measuring scoop. These are a good value as other ingredient pins cost much more. Easily sores 50lbs of flour or sugar. My only complaints are: 1. The scooper is like a box with a handle, which makes pouring powdery ingredients difficult. 2. Some times the door get hung up and is annoying to close. We use these for our ingredients (chocolate chips, coconut flakes, sprinkles, sugar, candy bits) and it could not work any better! They are super neat and the clear lid makes it easy to know what is inside. I look at the measuring scoop as a freebie because the container is worth the price. Highly recommend! A great product for large batch bakes, I use these shelf ingredient bins in my dry storage area to hold bulk items like 100 pounds of sugar, flour, etc. I love the locking mechanism on the lid that holds it in place while I scoop out ingredients. these are solid quality and can definitely hold a lot of ingredients. the one thing to be aware of is that the lid flips open instead of sliding, so you want to be sure to have enough clearance above it to allow for this. otherwise, a very solid container for the price. This is exactly what I needed to hold a 50# bag of oats. The 50# bag fit when I took the plastic divider out of the inside. The only reason I give it a 4 instead of a 5 is the little piece that is supposed to hold the cup is not very sturdy and keeps coming off. Excellent product for convienient storage, which we will be using for our sugar. It fits perfectly under one of our stainless tables. It also comes apart for easy cleaning. I bought these ingredient bins for my bakery and I really like them. They are easy to use and also have FIFO feature. I highly recommend this product. Very pleased with the overall quality. It is easy to use as well as keep clean. Especially like how easy the lid is to remove for refilling. This is a great ingredient bin, much sturdier than what our local stores carry, and those hold smells too. So sturdy, it is kept close to the range and has not reacted to the heat at all. Was a bit bigger than we ended up needing, but its not an issue! These bins are really solid. They definitely have enough storage space to house the contents of a 50 lb bag of grain. The lid pops up to be higher than the height of the bin itself, which you should bear in mind when making measurements. These 12.6 gallon bins are wonderful! We just bought a couple of them to store brown sugar and powdered sugar in the cooking labs of our high school culinary classroom. They have helped organize our classroom so much and have given the students easy access to the ingredients. We love these bins! These ingredients buns come in very handy for breader, flour and we even use one for sugar. Very durable, easy to clean, and conveniently stack for saving space. Love these ingredient bins! The 12.6 gallon easily holds 50 pound bags of ingredients, making organization much easier in our crowded kitchen. In addition, the measuring cup makes an excellent scoop and the bins reduce our risk of contamination. We are happy with these Ingredient Bins They are exactly as described, and fit perfectly on our shelves. They are clean looking and we have never had a problem with them. The Baker's Mark 12.6 Gallon Shelf Ingredient Bin with 2 1/2 Cup Measuring Scoop is great for restaurants and for home use. It is durable and it keeps the contents fresh. This bin is a great addition to any bakery or commercial kitchen. It's incredibly sturdy and the lid is convenient to use. We use them for sugars and more! Love these! And so does the health department! The scoop that can hook on the side gives the HD great joy. What more can someone that owns a restaurant want?? Overall a very solid bin but compared with Rubbermaid brand the hinge is not easy to use or very versatile. Also, the clip that holds up the scoop isn't a great design but the most important thing is it keeps bakery ingredients clean and dry. These bins are solid and it is so nice they are stackable. They really help save space and keep our ingredients fresh and bins sanitary. I really like these storage containers, they fit well on wire racks and countertops and stack easily. This size is a bit small for most items. we use it to store rice. I wish the opening was a bit bigger to make it easier to use. The small cup that comes with it doesn't get much at a time. We haven't used our bin yet, but we were a bit disappointed to find out the plastic used was a #5 rather than HDPE. HDPE seems to be most common when the material is listed as heavy duty plastic. This information wasn't available unitl after we purchased it. Customer service will tell you the same information that's available from the product description/details which isn't very helpful. Great item for the use of storage of sugars and other ingredients in the kitchen. Will recommend to any restaurants should buy this item for there store! Perfect size for my smaller back kitchen area. Fits on counter-top refrigeration or under my 8' work table with ease. Big enough for 50# of potato but also great for bulk storage of flour/sugar/etc! I honestly LOVE these bins! I purchased 3 and will definitely purchase more if needed. They are large enough to fit a 50lb bag with a little extra room and can be stacked. They have a clip for the scoop and the lid stays in place when opened. Great quality! Sturdy and well made. These are great for keeping your ingredients fresh due to the thick walled door and the nifty divider inside which allows old product to stay to the front while new product is dropped in behind the divider. These work really good. We (along with our health department) like the fact you can clip the measuring cups on the inside of the bin. You won't be disappointed. 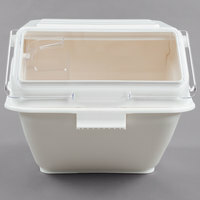 I've bought two of these bins to help organize my dry storage. They are stackable and efficient. Great product and fortunately very affordable. I'll purchase more in the future.